Man In 2014 Anti-Semitic Shooting Found Guilty Of Capital Murder : The Two-Way Frazier Glenn Cross Jr. was 73 years old when he opened fire on people in two locations near Kansas City, Mo., last spring. Frazier Glenn Cross Jr. (left), seen here at a hearing in Johnson County court in Olathe, Kan., last December, is a self-described white supremacist who killed three people in two attacks last spring. 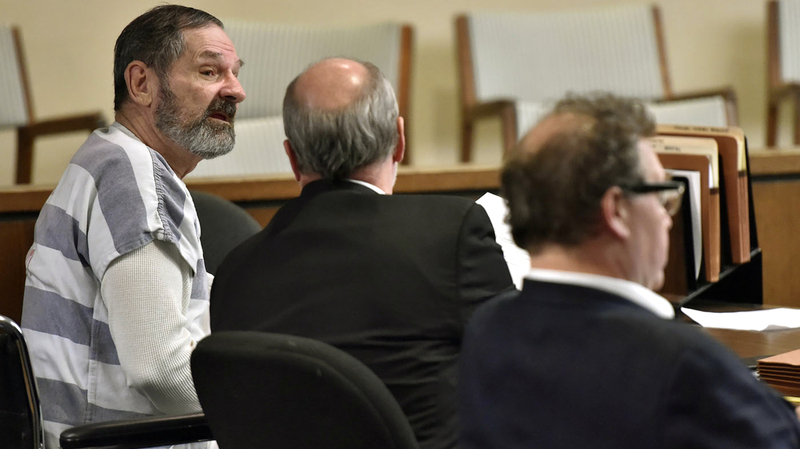 A jury has found Frazier Glenn Cross Jr., also known as Frazier Glenn Miller Jr., guilty of murder for killing three people in attacks at a Jewish community center and a Jewish retirement home near Kansas City, Mo. The jury will next decide whether he should be executed. In their deliberations, the jurors took less than two hours to return the guilty verdict, The Kansas City Star reports. Cross was 73 years old when he opened fire on people in two locations last spring. He had driven several hours from his home in southern Missouri to carry out the attack. Cross is a former grand dragon of the Ku Klux Klan who once ran a paramilitary camp in North Carolina and had been known for years to law enforcement agencies and organizations that monitor hate groups. "Frazier Glenn Cross Jr. — aka Frazier Glenn Miller Jr. — opened fire at a suburban Kansas City Jewish community center and a nearby retirement home on April 13, 2014, killing William Corporon, Reat Underwood and Terri LaManno, none of whom was Jewish. "Cross represented himself at trial. He repeatedly accused the judge of trying to silence his extremist views. He interrupted Judge Thomas Kelly Ryan's reading of the verdict.
" 'We the jury find the defendant guilty of capital murder on Count 1,' Ryan said. "The jury also convicted Cross on a number of counts including attempted murder. The same jury will decide whether Cross will get the death penalty or life in prison."